Welcome back from what we hope was a wonderful March Break for all! We're excited for the spring term and warmer weather to move school life back outside. March Break was a busy one for many of our students and employees. We had more than 120 Appleby students and 23 employees travel to 12 different countries to participate in meaningful educational experiences as part of their respective Global Experiential Trips. Keep an eye out in future issues of Appleby This Week for pictures and summaries. There was also a great deal of activity on campus as Appleby Camps hosted another very successful March Break camp, and construction of the A.W.B. Alumni Centre for Athletics and Student Life continued with substantial work having been completed on the building's exterior brick work and the double gym. We're looking forward to sharing in this excitement with you! It Was a Busy March Break! Substantial progress was made on the A.W.B. Alumni Centre for Athletics and Student Life over March Break. The building's exterior brick work is almost completed and further progress was made in the facility's double gym. Installation of glass panels for the inside of the building is also underway as interior finishing continues including tiling work. But we're not done yet! As we head into the month of April there remains a significant amount of work to do. Construction crews are working diligently to get the building completed with a focus on ensuring we have occupancy permits for the Field of Dreams Gala. To view the latest time-lapse video of the A.W.B. Alumni Centre, including an interior tour, click here. We invite you to check out the new and improved Parent Central by clicking on the Parent Central icon located on the homepage of www.appleby.on.ca. When you do, you will experience an improved online experience complete with a contemporary new design that provides informative content in a visually impactful way. The new Parent Central offers a variety of features such as: School News, Upcoming Events, a social media feed showcasing Appleby's posts on Instagram, Twitter, Facebook and YouTube, buttons that link to popular webpages such as the Appleby College Parents' Association; the new online College Shop (see announcement below); Volunteer Opportunities, plus a customized 'My Student Info' site that provides information specific to your child(ren) in a user-friendly format with enhanced functionality by simply logging in with your Parent Account. Over the coming week please take some time to check out the newly designed Parent Central. We will continue to tweak and assess different elements and features on the new site and we appreciate your patience as we complete the finishing touches. We would also love to get your feedback. 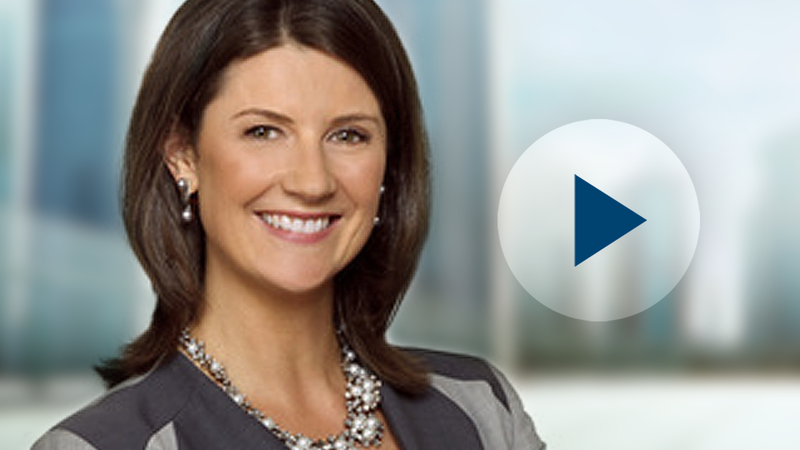 Please forward comments to communications@appleby.on.ca or click here. Announcing Appleby's New Online College Shop! It's the start of the spring term...does anyone in your family need an Appleby t-shirt, water bottle, or hoodie? Check out the redesigned online College Shop! With a contemporary new look, the user-friendly website makes it easier than ever to browse and purchase. When you shop online, you can have your order delivered directly to you, or it can be picked up from Nicholas Arts Centre front reception. Shopping online couldn't be more convenient! On Wednesday, March 27 Senior Two student Colby Robinson will present his chapel speech. Appleby will also host a special service led by the Truth and Reconciliation Youth Initiative Club which will focus on the theme of "Giiwedinong: Bringing Knowledge Home" and explore the importance of valuing indigenous ways of knowing. The Ontario Secondary School Literacy Test will be held on Wednesday, March 27 in the Gym from 8:00 to 11:30 a.m. All Upper Two students (and any Senior students who have been notified), are reminded to bring black or blue pens, sharpened pencils and erasers. Students are required to pass this important test in order to receive the Ontario Secondary School Diploma and their Appleby College Diploma. On Wednesday, April 3 from 9:00 to 10:00 a.m. in the LEC, Fraser Grant '87, assistant head of school, academics, will outline Appleby's academic curriculum, highlight aspects of each of our departments, and explore the ways in which our programme responds to current thinking and education. Coffee and a light breakfast will be served. To RSVP, please click here. Appleby students enrolled in a senior French course have the opportunity to participate in an international French language assessment. This will give students an official certification of their competency in the French language. The Diplôme d'études en langue française (DELF) evaluates speaking, listening, reading and writing skills, and students can be awarded a diploma by the French Ministry of Education. This diploma is recognized in over 175 countries. The level achieved by the students is a proof of their ability in their second language. The next series of exams will take place at l'alliance française in Mississauga at 9:00 a.m. on Monday, April 8 (Level B2) and Tuesday, April 9 (Level B1). Students are encouraged to view the practice exams and to speak with their French teacher about this opportunity. 2019 Appleby Summer Camps – Open for Applications! While Summer Camp might seem far away, the team at Appleby Camps can't wait to welcome you back for another fun-filled and exciting camp season! To check out our Summer Camps programs click here. As you will see, in addition to adding a number of exciting new programs, we've kept many of the 2018 programs our campers loved including Leadership Camps specifically designed for ages 12-14, and 14-17. Senior Leadership provides participants the chance to build on the following skills: group dynamics, communication, cooperative learning, leadership styles, followership and confidence, and also gain their Standard First Aid and CPR-C certification. This year, they will also be participating in an overnight hiking out-trip making it a two-week camp! Please visit www.appleby.on.ca/camps or contact the Camp Office at 905-845-4681 ext. 113 to learn more! 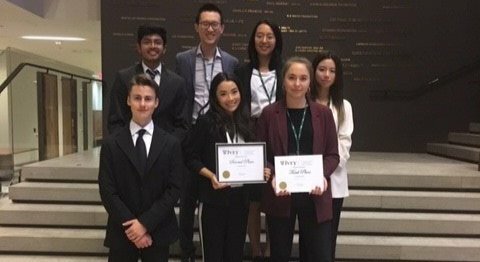 On March 2, Senior One students Antonina Dudina, Crystal Jiang, Avery Judiesch, Arush Karia, Lex Perley and Tao Yang participated at the annual Ivey Business School Competition. They were assigned teams and responsible for analyzing, preparing and presenting a business case study to a panel of judges in only three hours. The focus of the presentations was centered around how the National Hockey League could increase their presence in the United States after the 1995 lockout. With 12 teams and over 90+ students, Avery's group came in second and Antonina's team came in third. Congratulations! 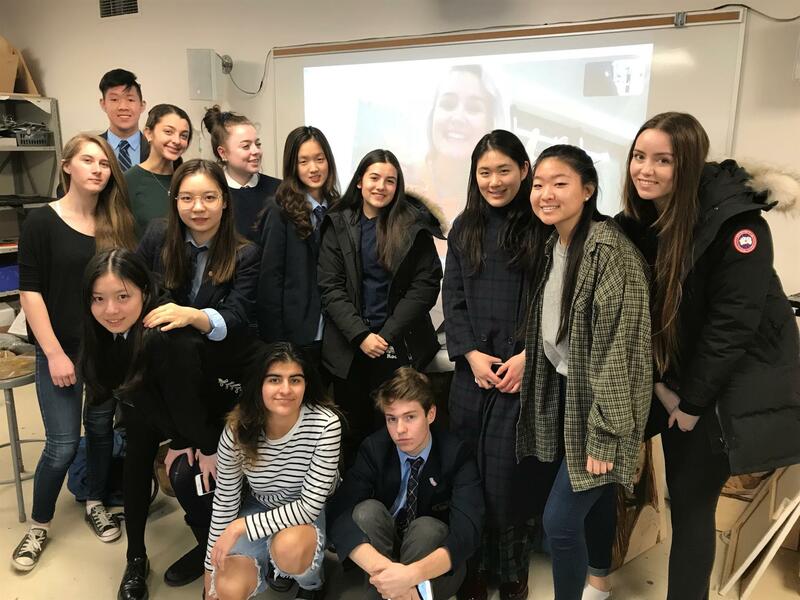 On February 25 and 26, students in the Advanced Portfolio co-curricular talked via Skype with Appleby alumni Suranart (Ta) Kasitipradit '15, Abbey Gaskin '17, Charlotte Thomspon '14, Rika Nakayama '16 and Marley Treloar '13 about life in art school and their career experience in the arts post-graduation. They are incredible role models for our current students! On March 4, Rami Hamadi '11 was a guest instructor in Appleby's Senior Two dance class. Students enjoyed learning the Dabjke in preparation for Appleby's Middle Eastern luncheon on Thursday, April 4. Dabke is a traditional Levantine folk dance that is very popular in Lebanon, Syria, Jordan and Palestine. It is seen throughout the world at weddings, family gatherings and celebrations. On March 5, a group of Appleby students attended an event to celebrate International Women's Day. Two time Olympic Gold Medalist Catriona Le May Doan was the keynote speaker, and she shared her story of rising from failure and overcoming obstacles. The day empowered students to recognize and celebrate women, as well as support their accomplishments. 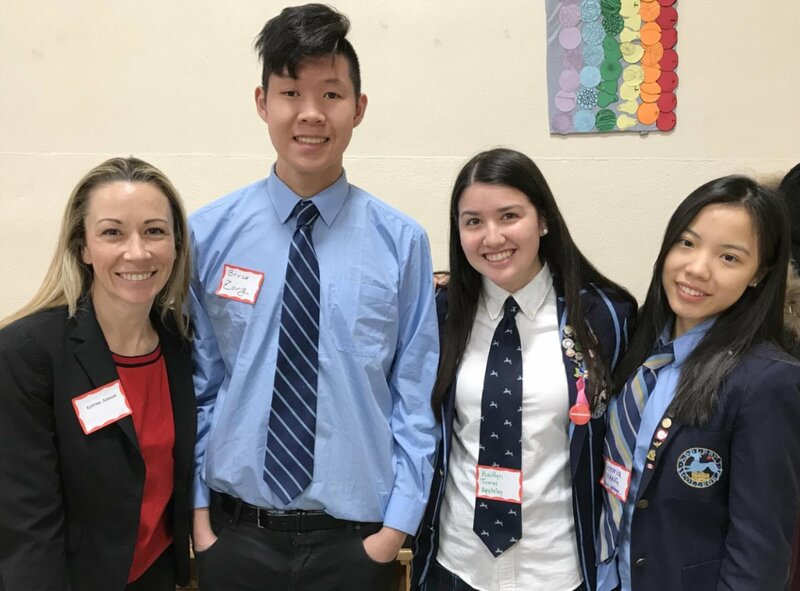 On March 6, Upper Two student Cheng (Bruce) Zong, Senior Two students Kaitlyn Tomas and Xinzi (Victoria) Yang, along with Katrina Samson, Head of School and faculty member Brendan Samson, visited Oakwood Public School to celebrate the 20th Anniversary of the Oakwood Breakfast Program. Appleby students have been supporting this morning program for 14 years. Members of the local community, the Halton District School Board and sponsors joined students in the celebration. 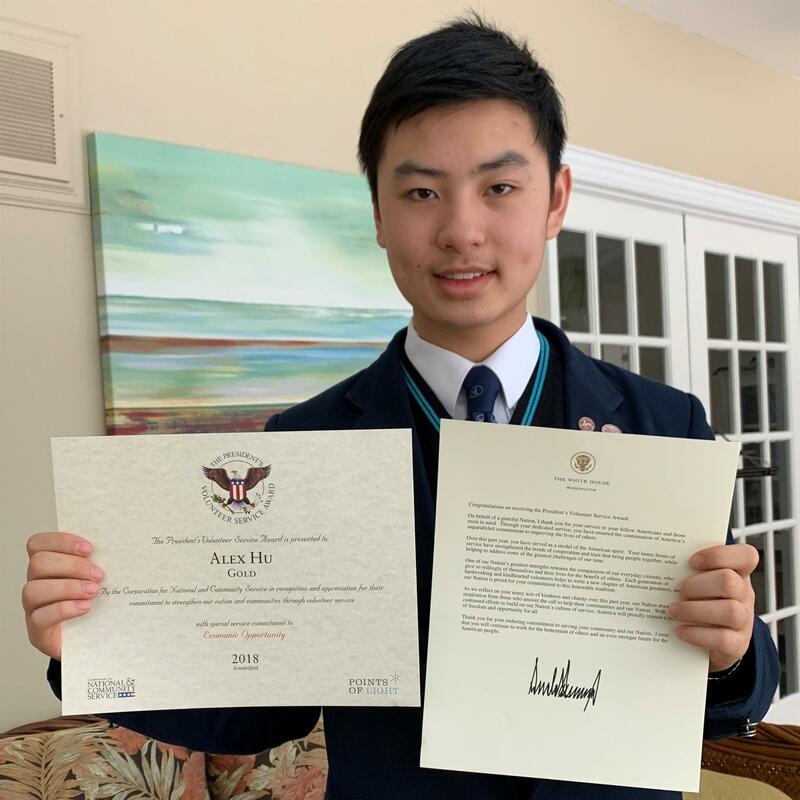 In December 2018, Upper Two student Alex Hu received a President's Volunteer Service Award from the White House, an award signed by the President of United States. Alex received recognition for his special service commitment to economic opportunity. Congratulations! Members of the Appleby community are invited to an evening with Lea Waters, PhD on Thursday, March 28 from 6:30 to 7:30 p.m. in Willis Hall. A psychologist, researcher, speaker and author, Lea is one of the world's leading experts on Positive Education, Positive Organizations, and Strength-Based Parenting and Teaching. To reserve your seats(s) please click here. An RSVP is required by Tuesday, March 26. Appleby College's 2019 Gala Field of Dreams: Online Auction Coming Soon! Platinum Toronto Maple Leaf tickets for the 2019-2020 season with dinner at any of Oliver & Bonacini restaurant located in Toronto, valued at $1,400. One-of-a-kind charcuterie boards, art work, spectacular wood pieces for benches and tables, and other priceless specialty items made from trees from the Appleby College campus. An LG 65" 4K LED Smart TV, valued at $3,500. Items or gift certificates from some of Oakville's best restaurants and retailers including Pasquale's Trattoria, Kenzo Ramen, Mye Japanese Restaurant, True Flowers, Burrows Clothiers, Ava Hair Studio & Spa, and more! Appleby College's 2019 Gala Field of Dreams: Live Auction Sneak Peek! 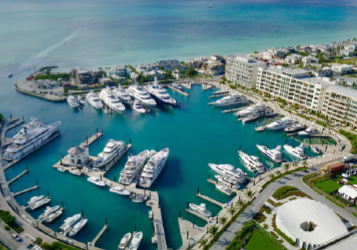 Trip for eight to Albany, a luxury resort set on 600 ocean-side acres on New Providence in the Bahamas! Valued at $32,000. Catered dinner at your home for eight people with a 10-course dinner catered by Season's with wine pairings, valued at $3,100. Classic Asia trip for two, with a chance to explore some of Asia's most incredible cities, valued at $30,000. A stunning Tiffany T square bracelet in 18 karat gold with pave diamonds from Tiffany & Co., valued at $15,600. For more information on the event, contact Victoria Harrison '06 manager, events at vharrison@appleby.on.ca or visit www.appleby.on.ca/gala. Now that the second term is over, it's time to visit the Lost and Found and look for any items you may have lost. The cupboards are busting with winter coats, shoes and duffle bags - you may not even know you're missing something! All unclaimed items will be donated to Safetynet on Friday, April 5. Please consider labeling your clothes, it is much easier to reunite you with lost items. To report lost items, e-mail lostandfound@appleby.on.ca. As a parent at Appleby, you are welcome and encouraged to attend meetings of the Appleby College Parents' Association Executive Committee. Our next meeting will be held on Tuesday, April 9 at 7:00 p.m. in the Raymond Massey Reading Room. If you have any questions or require further information, please contact Julia Baillie, recording secretary. Each year in April, the ACPA organizes an Employee Appreciation Luncheon for Appleby employees. Without this amazing group of people, our school would not be the wonderful place it is for our children. The 2019 Employee Appreciation Luncheon will be held on Thursday, April 25 from 11:30 a.m. to 1:40 p.m. in the Schlesinger Dining Hall. All Appleby employees are invited to the luncheon, as a way of expressing our gratitude for their tireless efforts throughout the year. This luncheon is a great opportunity for parents to volunteer, meet new parents and help say a big "Thank You"! Its success depends on the enthusiasm of our volunteers. All food is provided by parents or parent donations and the dining hall is transformed. It is easy to get involved, you can bring a dish, or help volunteer to serve/wait tables or both. It is a wonderful day showing the true community spirit of our school and everyone is always overjoyed with the fantastic food our parents provide and the way in which they are truly made to feel appreciated!